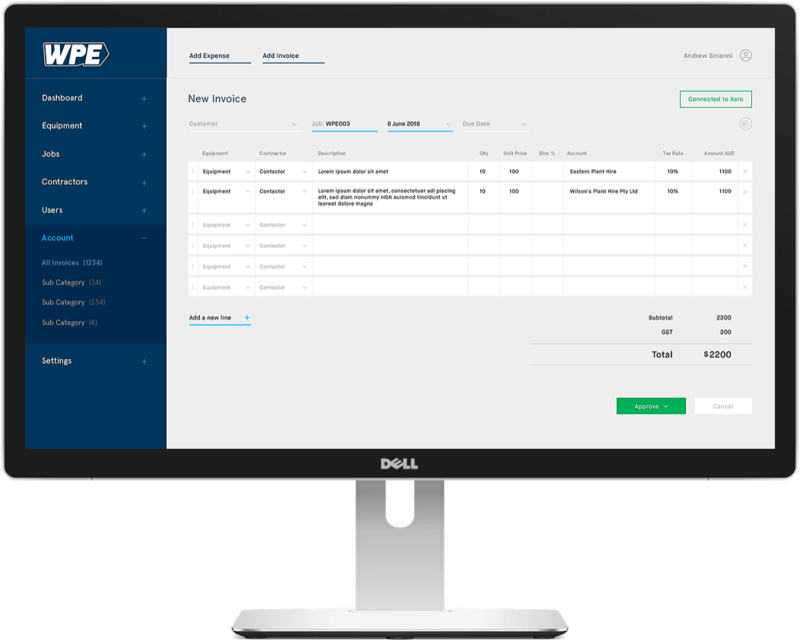 DCODE GROUP designed and developed a custom, Operations Management Solution for WPE to streamline their operations and add additional meta-data to their accounting functions. WPE were looking to migrate to a Xero to simplify their accounting functions; but they needed a way to report on fleet profitability. Their current accounting platform was overly complicated and required significant manual intervention. But it allowed them to gain good insight into their fleet profitability. The brief was to simplify their operations; while still providing a strong level of insight into the performance of the business. We sat down with WPE to identify how their business worked. We then designed workflows around the scheduling of equipment; allocation of staff to equipment; and timesheets - and built this into the software. As Xero was being used in other parts of the business, it made sense to use it again here. So we built an Invoice/Bill solution that allowed Xero to power the data - while storing what equipment/employee/job the transaction was associated with. As a result, we were able to implement a flexible, cloud-based system that offered scheduling, rostering, timesheets, payroll and accounting - with functionality to link transactions to jobs, equipment and employees. With the initial launch meeting the client's requirements, we continue to work with WPE on enhancements and optimisations to continue to streamline their operations. With basic scheduling/rostering now completed in minutes, we're identifying a range of improvements to other areas of the business. WPE now import their job schedules automatically. Timesheet data from the vehicles is automatically imported and matched against their roster. This generates invoices which are batched and sent to Xero. After all this, WPE can see their real time profitability at a macro level and for each truck - with a Xero reconciliation built in too!